Almost three years ago, my friend and I started a free, open mic comedy night at a pub in St Albans. 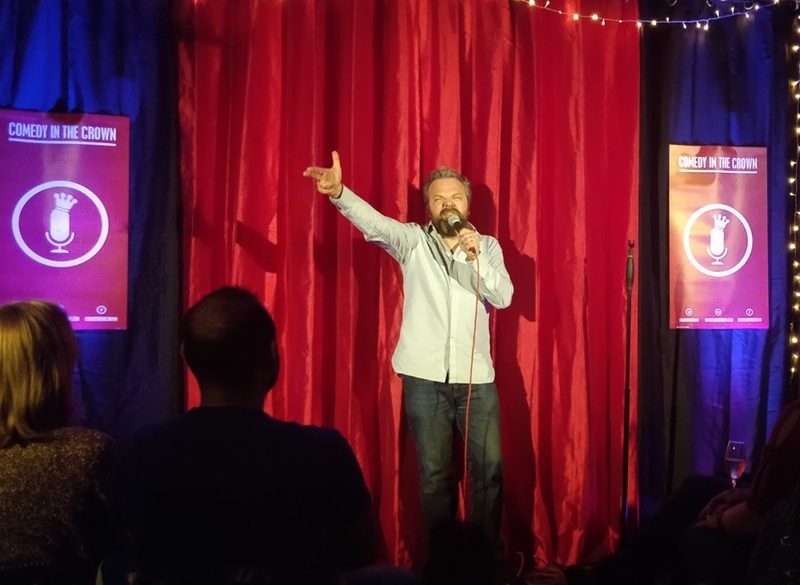 Comedy in the Crown quickly grew from an experiment held once a month, into to a pretty solid, weekly comedy night which we are both rather proud of. So it was fun and exciting to try something new - a night with four professional comedians. We were delighted with the results. Over the course operating Comedy in the Crown, Lee and I have come to know the local audience. We are very lucky to have some lovely regulars who support us most weeks, but in addition to that we've learned what types of acts tend to do well in St Albans and at our night. 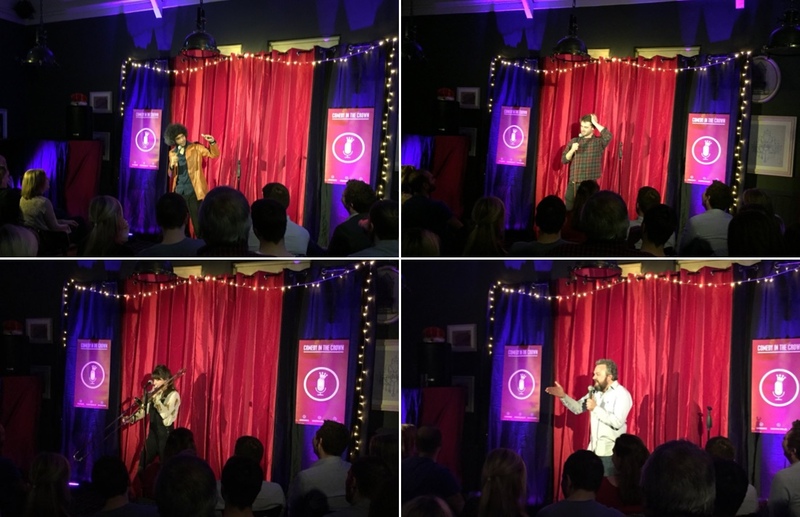 It's wonderful to see the enthusiasm so many performers have for coming to The Crown, and we've tried to give opportunities to comedians with different levels of experience, and a wide variety of styles. Of the more than 400 different performers who have appeared at comedy in the Crown, several have become audience favorites who have performed multiple times. There is a friendly atmosphere that we worked hard to cultivate, and cherish. Lee has amassed quite a bit of knowledge of different acts and has a freakishly good memory for their various styles. This helped us craft a lineup for our first ticketed night that we felt would land well with the audience we had come to know. Each one of them was wonderful, striking different tones which resonated with the audience. Our intimate but (we think) snazzy room limits us to just over 50 tickets, so the audience really got to connect with the acts who might normally be in much larger rooms. While we could announce Masud, Ben and Faye in advance, Hal was a little different. Hal is preparing for an extensive tour at the moment (go and see him if you possibly can. He's brilliant) and so we needed to be a little secretive about his appearance. Billing him as "a mystery TV star" was all we could do in advance, and keeping the secret going until half way through the night gave us a wonderful payoff as we revealed who our "mystery star" would be, much to the delight of the audience. Lee and I tend to share the responsibility of MC-ing the nights. We'll take it in turns so that we each get to enjoy introducing all of the acts and being the face of the night. I was extremely fortunate that on this occasion it fell to me to be the host, which was an honour and an utter treat. Not only because I had the thrill of introducing such accomplished acts, but also because of the enthusiasm and warmth of the audience who could not have been better (despite my teasing). The night went off without a hitch, and the response from the audience was wonderful. We'll have to do it again. We'll be working out how we make this kind of night fit with our open mic night, and looking for the next lineup and mystery headliner who will work well with our audience, who, I'd like to think, will be as eager for more as I am.